Wear in tribological contacts results in generation of wear particles of various sizes and shapes and these particles impact the performance of the mechanical devices. These particles may create additional mechanical damage or act as catalysts and adversely affect the lubricating properties of lubricants. The size of the generated wear particles determines the severity of the impact. The size of particles also determines the evolution of friction coefficient during initial stage of wear – running-in. In mixed lubrication regime the change of roughness profile is closely related to the wear particle generation. In turn, the evolution of surface roughness determines the friction coefficient. Therefore, the knowledge of the wear particles size evolution allows to predict the evolution of the friction coefficient. 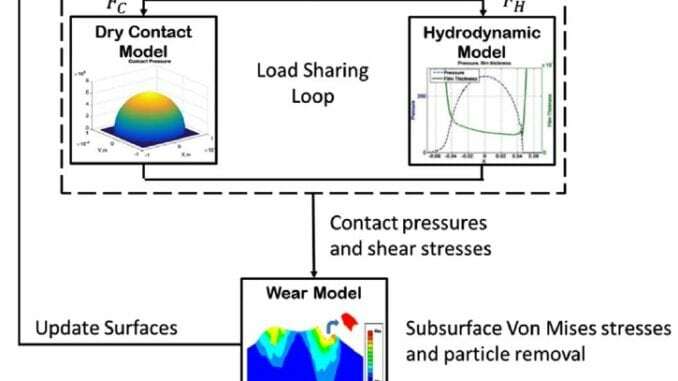 In Surface Technology and Tribology group of University of Twente we developed a model to predict the size of wear particles formed in lubricated contacts and it was applied to calculate the evolution of the friction coefficient during running-in. Typical evolution of friction coefficient with wear during running-in is shown in Fig. 1. Fig. 1. 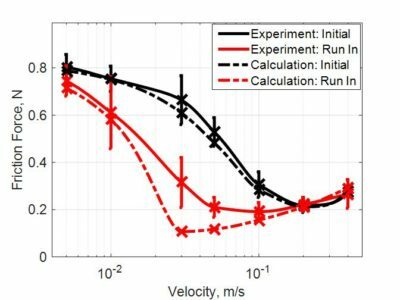 Friction coefficient at 0.05 m/s sliding speed a) measured curve b) calculated curve. Reprinted with permission from . As shown in the Fig. 1, the typical friction process starts with high friction coefficient (Initial) and after initial phase stabilizes at a lower – (Run-In) level. 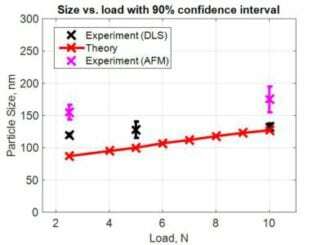 The theoretical model was validated using experimental data by comparison of initial and run-in values of coefficient of friction. The results are shown in Fig. 2. Fig.2. Initial and Run In friction coefficient curves, experiment vs. calculation. Reprinted with permission from . Prediction of the initial friction coefficient by the model is in a reasonable agreement with the experimental data for both the initial and run-in friction coefficient. It can be noticed that for the sliding speeds of 0.03 and 0.05 m/s, the model underestimates the friction. This is ascribed to the roughening of the surface due to abrasive wear of particles re-entering the contact, an effect that is not included in the model. The largest change in the mean coefficient of friction due to running-in is achieved in the mixed lubrication part of the friction (Stribeck) curve (0.03–0.05 m/s). Obviously, the effect of running-in was absent in the EHL regime, 0.2–0.4 m/s. In boundary lubrication the effect of running-in was less pronounced. After all, the fraction of the contact separated by the lubricant is already very small and will not change much by wear. The model was also validated by the measurement of wear particles size using Dynamic Light Scattering and a good agreement was observed. Developed model can be used to optimize the design of the mechanical components. As discussed in the original work, the hardness of the material can be chosen to obtained a minimum friction coefficient after running-in. For further details see “Generation of wear particles and running-in in mixed lubricated sliding contacts”, Aydar Akchurina, Rob Bosman, Piet M. Lugt, Tribology International 110 (2017) 201–208, http://doi.org/10.1016/j.triboint.2017.02.019. “Generation of wear particles and running-in in mixed lubricated sliding contacts”, Aydar Akchurina, Rob Bosman, Piet M. Lugt, Tribology International 110 (2017) 201–208, http://doi.org/10.1016/j.triboint.2017.02.019. In the real world, 3rd-body wear particles in lubricated contacts do not wash themselves in IPA and DI water, then deagglomerate themselves via centrifugation for almost two days. In real world lubricated contacts, 3rd-body wear particles are subjected to (and cause) all manners of horribleness. They agglomerate, fuse, and are covered in contaminates. As we travel farther and farther away from reality in these experiments (simulations of reality), we loose sight of what is really happening in lubricated bearing contacts. Take bearing, spin until broken, open bearing, study surfaces. Aydar, in your future continued efforts to model the size and impact of 3rd-body wear particles in lubricated contacts, are you going to negate the reality of agglomeration? Further, when dealing in comparative radii of non-spherical particles, how is the model accounting for the highly irregular shapes of the particles and their differing contributions to friction and surface damage based on morphology? My earlier point was related to the tendency of tribological studies to divorce themselves from reality. Continuing the model based upon data achieved from centrifugation of wear particles to release agglomerates is not going to yield accurate conclusions. We would like to be able to consider agglomeration as well of course. It is not so clear though how largely the wear process, in particularly mixed lubrication conditions, is affected by the agglomeration itself. So the current model would help one to answer this question. We also used sonication to brake possible agglomerations. The model does not consider the particles to be spherical. They are actually of irregular shape and in our previous article (DOI: 10.1007/s11249-016-0701-z) we compared calculated length, width, depth of the particles with the AFM data. But for the sake of convenience and also to be able to compare the data with DLS measurements, we introduced an equivalent radius of the particle. In my opinion, the developed model represented the testing conditions (so the reality) very nicely. We did not use any fitting parameters, and the results suggest that we describe the reality quite well. So far, we don’t know the degree of agglomeration and also we don’t know how much the agglomeration of the wear particles affects the process, at least in these conditions. So we could use the model to answer these questions and setting up the right experiments. I think that we should go from simpler models to more complex. Based on the developed model we can consider all kinds other situations by adding additional features to the theory. This poor guy (real reality) doesn’t want any more modeling done, he wants somebody to stop the asperities in the lubricated contacts destroying the bearing and producing so much heat that the lubricant boils away. I’ll bet there is agglomeration in his model ;), when the failed bearing starts shooting metal into his engine as the inner race begins to displace laterally from the resulting wear… https://m.youtube.com/watch?v=k5DbwqhFPjY. My point here is about departures from reality in modeling and in the lab, and the pressing need to simply address the real world problems in tribological contacts, namely the presence of asperities themselves in such contacts. Wear modeling in the pursuit of new AW/EP additives is futile when the failure mechanisms produce sufficient heat to boil away the lubricant and shoot metal into the engine. In short, it’s time to just make the asperities disappear.